Al-Assad had 11 children, six boys and five girls. Stemming from his love of Palmyra and ancient Palmyrian culture, al-Assad named one of his daughters Zenobia in honor of a well-known Palmyrene queen. In addition, one of his sons began working with him in Palmyra after completing his schooling.6 After al-Assad officially retired in 2003, he continued working with his son and other members of the Palmyrian excavation site and museum. In this way, al-Assad continued to be an integral part of the unraveling behind the secrets lying in Palmyra, translating ancient texts as recently as 2009. Al-Assad was one of the few people on Earth who was fluent in the language of ancient Palmyrian. By the end of his career, he had translated over 3000 lines of text. In addition, he taught himself English to be able to communicate with visitors and scholars interested in the area. This allowed him to not only be able to better learn about and connect with his environment, but also share his learnings with a wider audience and share with the world what had captivated him as a youth to become devoted to Palmyra (here is showcased the educational capabilities of al-Assad, something he studied along with archaeology in college). After his death, many of Assad’s friends, family, and coworkers recalled how he was able to communicate with the Bedouin tribes of the area (who spoke a dialect of Ancient Palmyrian) one minute, and just as easily with foreign visitors, archaeologists and other foreign notables the next.6 For al-Assad, learning did not stop when he was able to understand the functionality of an artifact, or when he was able to deduce something previously unknown about ancient Palmyrians, it went on to sharing with the world the things he had discovered. One of the last major excavations al-Assad took part in was with Dr. Schmidt-Colinet in the early 1990s. During this project, the pair and their team were able to uncover a 4th century church as well as a house thought to have been occupied for about 700 continuous years.10 Before his retirement, al-Assad also issued and order to restore over 2 kilometers of the walls of Ancient Palmyra. After the completion, al-Assad also had the walls raised to their original heights.9 Visitors to the site since have been able to marvel at remains of a once great city, but for al-Assad, it was always about learning, excavating, and restoring the ancient city of Palmyra so it may come one step closer to being reanimated and as historically accurate as possible. It is a lifetime of work such as this that has distinguished al-Assad as one of the prominent archaeologists of the past few decades, and the greatest Syrian archaeologist to have ever lived. To help put into perspective what the loss of al-Assad meant to the world, Amr al-Azm remarked, “Because he’d spent so many years working on this site, he was so familiar with the archaeology of the area and the city, he was a huge repository of knowledge, all acquired first hand just by being there, and working it. And really this vast repository of information has now been lost to us. And it’s not the kind of information you can acquire by reading a book or attending a lecture, it’s all very practical knowledge and information. And it’s all gone now.”12 Many other archeologists, scientists, and admirers expressed similar sentiments at the loss of a man so knowledgeable, humble, and devoted as al-Assad. His wisdom invaluable, experience unmatched, and passion unopposed, al-Assad has left a gaping hole in the world of archaeology that will never truly be filled. It is now up to his successors to continue the legacy of al-Assad. Despite having reclaimed Palmyra, there is a long road to recovery in restoring the damage done by ISIL. Worse still, much of the destruction is irreparable. However, the actions of al-Assad in sacrificing his life for the safety of his country’s heritage will surely guide the restoration process as a constant reminder of the importance and significance of the artifacts and structures still standing in Palmyra. For his dedication and lifetime of hard work, al-Assad was awarded the national Order of Merit award posthumously.6 In a time rampant with violence and senseless killing, many continue to look at the legacy of al-Assad, best personified by his resolution to stand by his life’s work in the darkest of times, as a lone beacon of light in a country ravaged by war. A true martyr, the death of Khaled al-Assad is a low point in history, and yet, he is a source of inspiration for future generations to look at, and hopefully learn from. 1. Belton, Padraig. "Remembering Khaled Al-Asaad, the Syrian Archaeologist Who Dared to Stand up to Isis." The Spectator. The Spectator, 20 Aug. 2015. Web. 14 Apr. 2016. http://blogs.spectator.co.uk/2015/08/remembering-khaled-al-asaad-the-syrian-archaeologist-who-dared-to-stand-up-to-isis/. 2. LeRiche, Pierre. "Isis in Syria: Khaled Al-Asaad – the Martyr of Palmyra." The Independent. Independent Digital News and Media, 1 Sept. 2015. Web. 14 Apr. 2016. http://www.independent.co.uk/news/world/middle-east/isisin-syria-khaled-al-asaad-the-martyr-of-palmyra-10481630.html. 3. "Syrian Archaeologist 'killed in Palmyra' by IS Militants." BBC News. BBC, 19 Aug. 2015. Web. 14 Apr. 2016. http://www.bbc.com/news/world-middle-east-33984006. 4. "Khaled Al-Asaad." Gariwo: The Gardens of the Righteous. Gariwo. Web. 14 Apr. 2016. http://en.gariwo.net/righteous/the-righteousbiographies/exemplary-figures/examples-of-civilcourage/khaled-alasaad-13897.html. 5. LeRiche, Pierre. "Martyr to Science in Palmyra: Archeologist Khaled Al-Asaad." Informed Comment. Informed Comment, 3 Sept. 2015. Web. 14 Apr. 2016. http://www.juancole.com/2015/09/science-palmyra-archeologist.html. 6. Arbuthnot, Felicity. "The War on Syria and “The Death of Civilization”: The Assassination of Dr Khaled Al-Assad, Guardian of Palmyra." Global Research. Global Research, 9 Sept. 2015. Web. 14 Apr. 2016. http://www.globalresearch.ca/the-war-on-syria-and-the-death-of-civilization-the-assassination-of-dr-khaled-al-assad-guardian-of-palmyra/5474828. 7. Shaheen, Kareem, and Ian Black. "Beheaded Syrian Scholar Refused to Lead Isis to Hidden Palmyra Antiquities." The Guardian. Guardian News and Media, 19 Sept. 2015. Web. 14 Apr. 2016. http://www.theguardian.com/world/2015/aug/18/isis-beheads-archaeologist-syria. 8. Killgrove, Kristina. "Archaeologists Respond To The Murder of Khaled Al-Asaad At Ancient Palmyra." Forbes. Forbes Magazine, 20 Aug. 2015. Web. 14 Apr. 2016. http://www.forbes.com/sites/kristinakillgrove/2015/08/20/archaeologists-respond-to-the-murder-of-khaled-al-asaad-at-ancient-palmyra/#5951320171fb. 9. Salloum, Muna, and Habeeb Slalom. 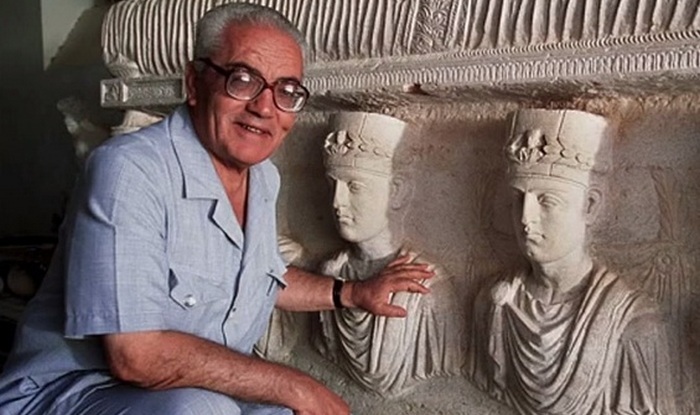 "Khaled Al-Asaad (1932-2015): Palmyra's Steadfast Custodian." Proquest. Proquest, Oct. 2015. Web. 14 Apr. 2016. http://search.proquest.com.proxy1.cl.msu.edu/docview/1729354007?accountid=12598. 10. MacDonald, James. "Archaeologist Khaled al-Asaad, Enemy of Isis." JSTOR. JSTOR, 23 Sept. 2015. Web. 14 Apr. 2016. http://daily.jstor.org/murdered-archaelogist-khaled-al-asaad/. 11. Paraszczuk, Joanna. "To Love Palmyra’s ‘Every Artifact and Every Stone’." The Atlantic. Atlantic Media Company, 24 Aug. 2015. Web. 14 Apr. 2016. http://www.theatlantic.com/international/archive/2015/08/palmyra-isis-khalid-al-asaad-beheading-isis/402148/. 12. Davy, Stephen, and Christopher Woolf. "He Looked after the Ancient Ruins of Palmyra for 40 Years. Now ISIS Has Killed Him." Public Radio International. Public Radio International, 19 Aug. 2015. Web. 14 Apr. 2016. http://www.pri.org/stories/2015-08-19/he-looked-after-ancient-ruins-palmyra-syria-40-years-now-isis-has-killed-him. 13. Mosbergen, Dominique. "Beheaded Scholar Refused To Tell ISIS The Location Of Hidden Antiquities." Huffington Post. HPMG News, 20 Aug. 2015. Web. 14 Apr. 2016. http://www.huffingtonpost.com/entry/khaled-asaad-palmyra-isis_us_55d54ecbe4b07addcb458baa. Deville, Mark. Khaled Al-Asaad, the Director of Antiquities and Museum in Palmyra, in 2002. N.d. Getty. The Spectator. Web. 14 Apr. 2016.